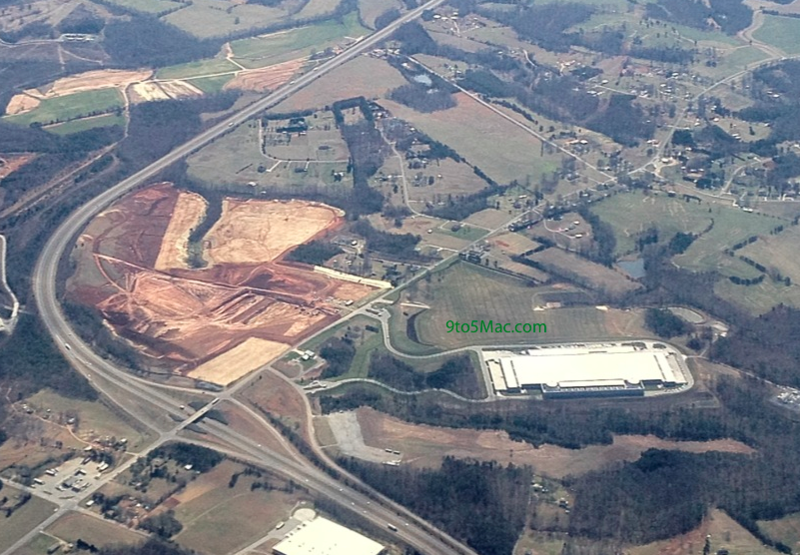 When Apple published its 2012 Facilities Report and Environmental Update, we got some new details on its plans for the now-under construction Maiden, N.C.-based iCloud data center. We reported that Apple planned to build the largest end user–owned onsite solar array in the United States across the road from the data center, as well as the largest non-utility fuel cell in the country at 5-megawatts. Today, Hickory Daily Record confirmed construction has officially begun. …this week, work has started on the main campus of the data center. Driving by the campus, you can actually see the structure from the road. That’s because part of the berm — an earthen wall — has been demolished as part of some type of construction… What type of construction taking place on the main campus is not clear. No one is talking, or seems to know. While it is unclear exactly what the new structure on the main campus will be, there are a few options swirling around. We know the 5-megawatt fuel cell will be next to the main data center, and the new building could house that installation. However, as HickoryDailyRecord pointed out, Maiden Town Manager Todd Herms said Apple originally planned to build two identical structures when it began construction of its Maiden data center. Apple only built one, so the new building could be the second building of the main data center. The report noted Apple’s main contractor for data centers in area, Holder Construction, pulled zoning permits last week for a “tactical data center.” Another permit issued on Wednesday named 34 acres of the main data center campus. The current 500,000-square-foot building only occupies about 11.5 acres, so its possible the new building will be larger than the current data center. As we pointed out in our overhead shot of the data center pictured right (Thanks PilotJohn), the report also confirmed land is being cleared for the solar farm’s construction across the road. Catawba County Economic Development Corp President Scott Millar told HDR that Apple should produce power with its new projects by October and finish construction by 2013. Apple said the new fuel cell installation would provide “40 million kWh of 24×7 baseload renewable energy” every year. Meanwhile, the 100-acre solar farm will provide 42 million kWh of clean and renewable energy over the same period. The company originally planned to spend $1 billion over nine-years at the location and hire approximately 50 employees. Millar said Apple hired 76 employees during the first year of operations. It is unclear whether the initial $1 billion investment considers these new expansions.